Atmel recently announced a two-pin, single-wire EEPROM intended for the Internet of Things (IoT), wearables, and more. The self-powered devices don’t require a power source or VCC pin, with a parasitic power scheme over the data pin. They provide ultra-low power standby of 700 nA, 200 µA for write current, and 80 µA for read current at 25°C. The AT21CS01/11 devices eliminate the need for external capacitors and rectifiers with its parasitic power scheme over a single data pin. Plus, their ultra-high write endurance capability to allow more than 1 million cycles for each memory location to meet the requirements for today’s high-write endurance applications. The AT21CS01/11 products include a simple product identification with a plug-and-play, 64-bit unique serial number in every device. Furthermore, they deliver industry-leading electrostatic discharge (ESD) rating (IEC 61000-4-2 Level 4 ESD Compliant), so a variety of applications (e.g., cables and consumables) can tolerate exposure to the outside environment or direct human contact while still delivering high performance. The new devices follow the I2C protocol, which enables easy migration from existing EEPROM with less overhead and the capability to connect up to eight devices on the same bus. The AT21CS01 devices offer a security register with a 64-bit factory programmed serial number and an extra 16 bytes of user-programmable and permanently lockable storag. The AT21CS01 is intended for low-voltage applications operating at 1.7 to 3.6 V. For applications that require higher voltage ranges (e.g., Li-Ion/polymer batteries), the AT21CS11 supports a 2.7 to 4.5 V operating range. The AT21CS01 devices are available in production quantities in three-lead SOT23, eight-lead SOIC, and four-ball WLCSP. 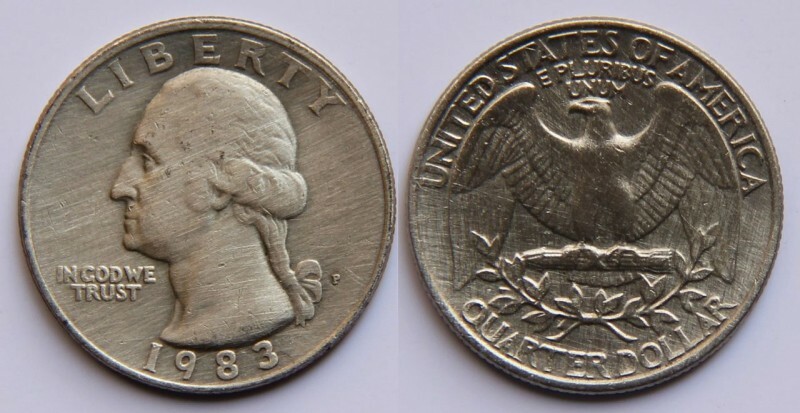 Pricing starts at $0.32 in 5,000-piece quantities. The AT21CS11 will be available in Q4 2015. Some experts predict it will be at least another decade before new memory technologies offer the low prices and wide availability to compete with NAND-based flash memory. Nonetheless, it’s worthwhile to look at potential NAND-flash successors, including phase-change RAM (PRAM), resistive RAM (ReRAM), and magnetoresistive RAM (MRAM). In December’s Circuit Cellar magazine, now available online, Faiz Rahman describes and compares the newest memory technologies available for embedded systems. “I cover only those devices that are now commercially available, but bear in mind that many other technologies are being hotly pursued in academic and corporate research labs worldwide,” says Rahman, an Ohio University visiting professor who received his PhD in Electrical Engineering from Imperial College, London. For example, last summer MIT Technology Review reported on a startup company’s testing of crossbar memory. The new technology, according to an August 14, 2013, article written by Tom Simonite, can store data 40 times as densely as the most compact memory available and is faster and more energy-efficient. The structure of phase-change RAM cells in reset and set states is shown. There have been several recent advances in phase-change RAM (PRAM) technology. 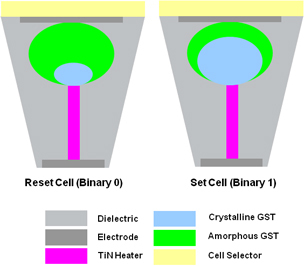 Perhaps the most remarkable is the ability to control the cell-heating current precisely enough to create several intermediate cell-resistance values. This immediately increases the memory capacity as each cell can be made to store more than one bit. For example, if eight resistance values can be created and distinguished, then the cell can be used to store three bits, thus tripling the memory capacity. This is now a routinely used technique implemented with PRAM devices. 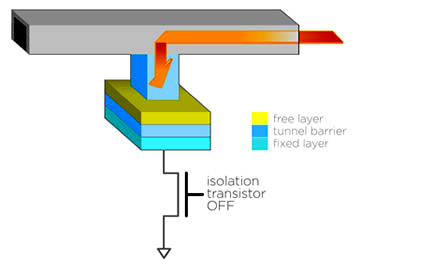 A spin-torque magnetoresistive RAM cell’s structure includes a free layer, a tunnel barrier, and a fixed layer. but fast nonvolatile memory. 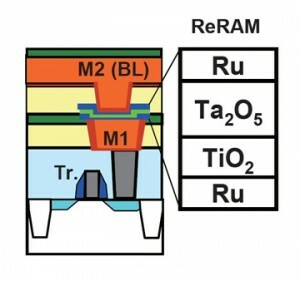 This combination is difficult to come by, but proponents of magnetoresistive RAM (MRAM) think boot times could soon become outdated as this new memory becomes a mature product…. MRAM’s nonvolatility alone will not make it a potential game-changing technology. Its high-access speed is what makes it special. Unlike other nonvolatile memory (e.g., EEPROMs and flash), MRAM boasts typical access speeds of 35 ns and potentially as short as 4 ns, with further developments. This combined with MRAM’s extremely high endurance and data retention periods of more than 20 years even makes the technology suitable for use as CPU cache memories, which is a very demanding application. 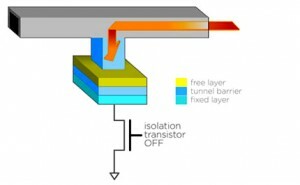 One further advantage of MRAM is that its basic architecture—where the access transistor can be formed directly on top of the magnetic tunnel junction (MTJ)—enables very dense integration, greatly reducing the cost of storage per bit and making MRAM well suited for use in solid-state disks. A ferroelectric RAM cell’s organizational structure is shown. after only a few milliseconds. This means that all DRAM chips have to be periodically read and every cell’s state must be restored every few milliseconds. The requirement for periodic “refresh” operations increases the power consumption of DRAM banks, in addition to endangering data integrity in the case of even short power supply dips. Within this backdrop, ferroelectric RAM (FRAM) became a potential game changer when it was introduced in the early 1990s…The permanence of induced electrical polarization in ferroelectric capacitors endows FRAMs with their nonvolatility. To write a particular bit, a FRAM’s cell capacitor is briefly charged in one direction to polarize the ferroelectric material between its plates. The capacitor voltage can then be removed and the bit state will be retained in the directional sense of the dielectric material’s polarization. No charges may leak away, and the polarization can be maintained for many years making FRAM, in a sense, a nonvolatile analog of DRAM…. A big advantage of using FRAM in microcontrollers is that just one memory can be used for program, data, and information storage instead of having to use separate flash, SRAM, and EEPROM blocks, which has been the trend so far. A typical resistive RAM cell’s structure is shown. utilizes materials and structures where suitable voltages can alter memory cells’ resistive states so they can store one or more data bits, similar to PRAM. There are strong hints that ReRAM is capable of very fast switching with symmetric read and write times of less than 10 ns. This comes with a remarkably low power consumption, which should make this technology ideal for many applications. As if these attributes were not enough, ReRAM cells are very small and can be placed extremely close together, which results in high-density memory fabrics. Rahman’s article also introduces manufacturers offering products with the latest memory technologies, but he declares no single memory device the best. Despite manufacturers extolling their particular products, those that succeed will need to be available in high volume and at low cost, he says. They also must offer high-storage densities, he says, a bar most new memory technologies struggle to reach.